One of the drawings submitted with the site plan for a new dialysis clinic off Pacific Boulevard. The Albany Community Development Department is reviewing plans for a new medical building which, according to the drawings, will house a dialysis center, part of a large nationwide chain. Architects based in Bellevue, Wash., have drawn up plans for a 7,500-square-foot building facing Pacific Boulevard at the southeast corner of Hill Street and Seventh Avenue. The applicants are asking for five lots bounded by the three streets to be consolidated for this project. They also request approval of their site plan. All five lots are vacant. The part of the property on the corner of Pacific and Hill, at 1001 Pacific S.E., used to be a Winchell’s Donut House before it closed in the late 1980s and then was demolished. 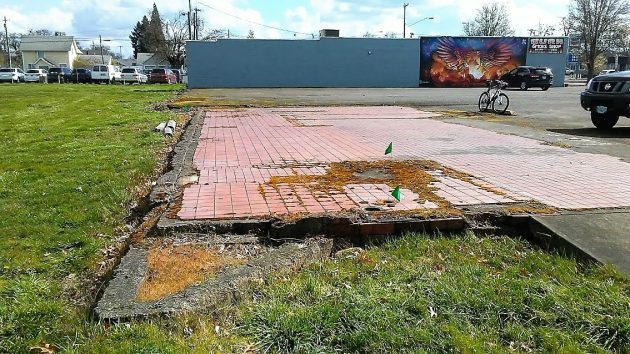 If you step on the lot, as I did Wednesday, you can still see the shop’s tiled floor. This area will become the parking lot. The clinic itself will back up to Seventh Avenue. Plans submitted to the city show the building to be occupied by DaVita, a chain of 2,510 outpatient dialysis clinics with 70,800 employees serving an estimated 198,000 patients across the country, according to its website. The headquarters are in Denver. In Oregon, the company’s clinics nearest to Albany are in Salem, Woodburn and McMinnville. Dialysis is a treatment to cleanse the blood of people with severe kidney disease. This will be the second dialysis center in Albany. 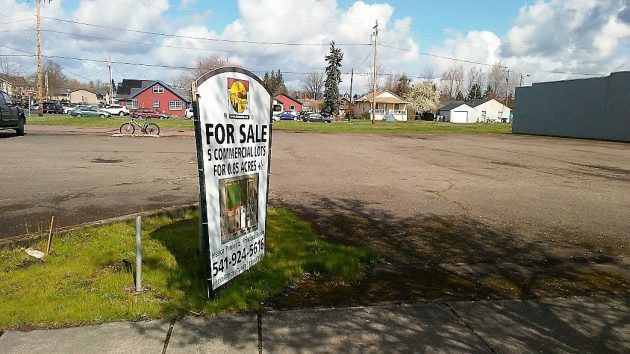 The other one, belonging to the Fresenius company, moved from Seventh Avenue in west Albany to a new building in the North Albany Village shopping center about a year ago. City planner Laura LaRoque says she plans to send notices to property owners near the DaVita site by Friday. The deadline for submitting written comments is March 23. This is the planned medical building site as seen from Pacific Boulevard. The doughnut shop was here, at 1001 Pacific Blvd. S.E. Do we really need two dialysis clinics in Albany? In case you haven’t heard free medical care is a right. No need for healthy living. If they build them people will come. A somewhat similar thought occurred to me while reading the article. Given the Federal Statutes regarding confidentiality of medical records – how can a business know that there is sufficient demand (or that there soon will be) for a second such medical facility here? Yes, we probably do need two clinics at the rate that the American people are being diagnosed with Type 2 diabetes. Yes, diabetes is a problem. But 5% of all new kidney failures every year can be attributed to NSAIDS. Those “harmless” little OTC pain relievers that so many people use.High dosage and long-rem use can be very harmful. And Ace inhibitors (Lisinopril, etc.) can also cause severe kidney damage as can the contrast used in many “scans”. You should also consider benefit VS risk of diuretics which are often prescribed to treat high blood pressure. Yes, we hear about the damage from alcohol and diabetes, but the Pharmacy companies aren’t to keen on advertising the risks of their medicines.